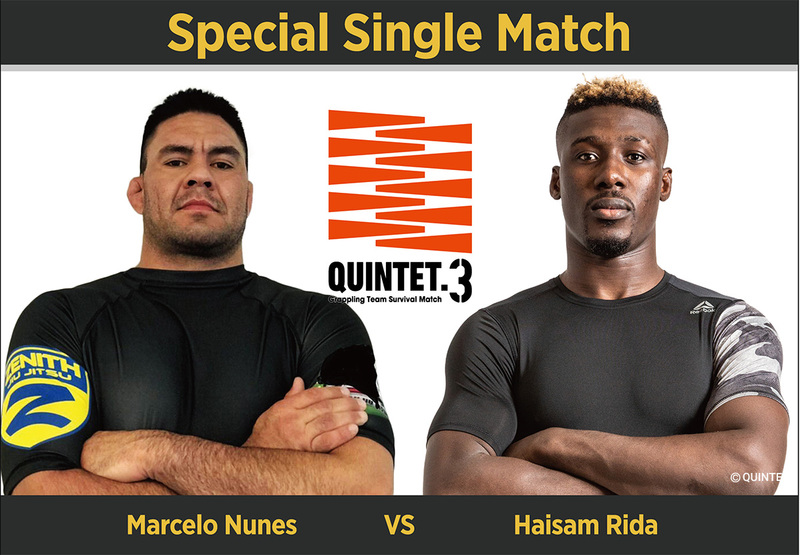 HOME > ニュースリスト > QUINTET.3 > QUINTET.3 Special Match Announcement: Rising Star Haisam Rida to Face Marcelo Nunes in Vegas! It is with great excitement and anticipation that we announce the latest addition to the QUINTET.3 card about to blow up in Las Vegas on October 5th. Haisam Rida stormed onto the scene in July this year at QUINTET.2 in Tokyo, Japan taking out three members of the tough Tiger Muay Thai team and eliminating them from the tournament. Rida went on to submit Richie ‘Boogeyman’ Martinez by armbar in the final round against Team 10th Planet. He is also a very active professional BJJ player and was recently awarded his blackbelt and fights out of Carpe Diem in Tokyo. Marcelo Nunes makes his QUINTET debut stepping to the plate against the lofty Ghanaian. Nunes was awarded his blackbelt last year from Professor Robert Drysdale – a six-time BJJ World Champion and UFC veteran. Taking five straight wins from his MMA debut, all finishes and four by submission, Nunes does not play around. This collision of these two big, aggressive BJJ players under the distinctive QUINTET rule set is massively anticipated by pros and fans alike. Will Nunes bring the next level aggression and overwhelm? Or will Rida stamp his name on US soil with his 5th win at QUINTET.3 in Las Vegas? Quintet.3 Tickets »»» NOW ON SALE!